This work describes how to improve the safety of the outdoor powered wheelchair. To make the outdoor powered wheelchair be a safe and convenient vehicle, we proposed to employ the sensor fusion to support the powered wheelchair navigation, and developed a prototype outdoor intelligent powered wheelchair. 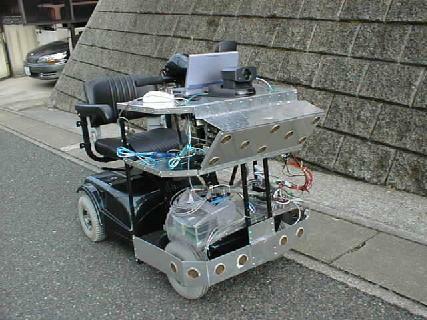 This outdoor intelligent wheelchair employed the ultrasonic sensors, the video camera, GPS (global positioning system), and PHS (personal handy system). It has the following four main functions. 1) It detects the obstacles on road, and avoids them autonomously. 2) It keeps watch on the operations of the rider. If the operation of the rider may collide with obstacle or may cause falling down of the wheelchair, the wheelchair will be stopped compulsorily. 3) In the pedestrian crossing with traffic light, it will catch the changes of the traffic light, and inform the rider by the voice message. And in the pedestrian crossing without traffic light, it will recognize the traffic situation, and try to cross the pedestrian crossing autonomously. 4) It sends the rough route map and the image from the video camera to the computer at home or care center at a constant interval, to let the people at home or care center know where and what state the powered wheelchair is in.